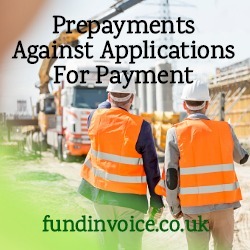 I wanted to find out how difficult it would be for a construction sector company to find prepayment finance against applications for payment. As I have seen previously with other searches, Google delivers quite an unhelpful set of results when one searches for say "construction finance against applications for payment". This might be a typical search term used by a construction sector customer that wanted prepayments against their applications for payment. The first results delivered, in response to my search for prepayments against applications for payment, were paid ads of which there were 4 at the top of the page. The top result was from Bibby Financial Services, who are active in funding the construction sector, providing prepayments against even uncertified applications, and so they could be a good result for someone seeking that type of finance. However, they are not the only option for construction sector funding, so I looked at the remaining results. The next advert from a Google advertiser was for a firm offering development finance, loans for large scale construction developments - not the type of funding I was seeking. The third result was for a company offering construction sector project management software, and the final paid result was for a real estate finance and capital markets business - again not what my example customer was looking for. All these were examples of Google advertisers in allied markets that do not deliver the service that I searched for - instead they are bidding to show up in any results that will be seen by construction sector companies. Turning to the organic results (that come below the paid adverts), those that are not paid for but are based on Google's algorithm, the next result was Bibby once again. Their entry was followed by a broker. I had a quick look at their application form, there were 33 different purposes for the finance that my example customers wanted to raise, including things such as "funding a pre-packaged insolvency". Whilst there were relevant options within the list, the wide variety of options could have been confusing. The remaining results on the first and second pages of Google were for a variety of different funders that do handle the construction sector. There were a couple of brokers within those results, including FundInvoice. Various funding percentages between 65% and 80% were mentioned (we found someone the other day that will fund the construction sector at 100% by the way). However, it strikes me that a construction business would benefit from speaking to a broker about the various options available, rather than just approaching various providers randomly. There are big differences between the costs, approach and risk appetites of various funders, and there were several highly flexible funders that didn't make it to the top of the Google results. The results are even more irrelevant if a customer were to search for "prepayments against applications for payment". The Google results ranged from NHS prescription prepayments through to advice from accounting software suppliers about how to account for prepayments. Very unhelpful for a prospect of the type that I described above. Please call Sean on 03330 113622 if you need some help telling the wood from the trees in construction sector prepayments against applications for payment.